Since 1991, the Ocean Master Advanced Dry Snorkel has guaranteed absolute dryness and incorporated the unique ability to stop water entry. Its airway automatically opens as you surface the water. With this snorkel, and not with a lot of other so-called "dry snorkels", you'll be able to completely submerge. Not a single drop of water will get in to your mouth. The Ocean Master Advanced Dry Snorkel is today the longest selling dry snorkel in the world. It won the International Invention Convention Gold Medal, is used by tens and thousands of people and offers many high quality features such as a heavy duty snorkel keeper (for keeping your mask attached to your snorkel), a rotating ball joint that prevents jaw fatigue, and a super-soft orthodontic mouthpiece. The most notable feature is an automatically opening airway which lets you have air as soon as you surface the water. Underwater, the snorkel is absolutely airtight. IS THERE A VACUUM EFFECT? When a snorkel is water tight, you would normally feel a vacuum in the snorkel. When you surface the water, the water seal would be "stuck" to the air openings. Not with an Ocean Master. There is no vacuum effect due to a specially-designed pressure release valve. The snorkel's top is made of impact resistant materials and is virtually indestructible. 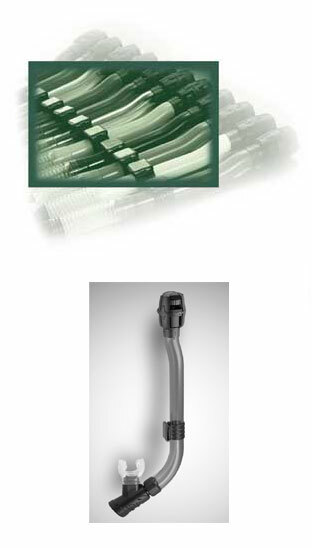 The mouthpiece area of the snorkel rotates on two three-dimensional axis (ball joints) to give you ultimate comfort. With a product with the highest customer satisfaction rate, you're not going to be disappointed.You'll have the perfect vacation. You're not going to have to worry about gulping down a mouthful of salt water. You'll be among the satisfied thousands of users of America's number one selling dry snorkel. You'll enjoy the way the system actually opens and closes upon water contact due to a patented anti-pressure release valve that helps open the airway as you surface the water. No other snorkel can open and close for you the way an Ocean Master can. No matter what, water clearing is never required. That means no more choking! At the surface, you won't have to worry about waves, whitewash or even splashes. An Ocean Master will ensure that you never get a single drop of water. If you're a scuba diver, you won't be annoyed by unexpected incoming water as you wait for for the boat to arrive. "My favorite, this snorkel's design let me breathe after a dive without having to clear the tube," say Los Angeles Times editor Scott Doggett. A ball joint, similar to what you'll find on the rear view mirror of your car or your showerhead, allows the mouthpiece to sit in your mouth at just the right angle. The ball joint connects the snorkel tube to the mouthpiece to ensure that you have comfort during use and a fully complete, perfect, dry snorkel. Compare the quality. You'll be amazed.